It seems like we say the same thing every year – but, here goes, “winter has arrived early this year.” During the winter season in Atlanta, weather can become sporadic, and temperatures can drop at any given time. Your dog’s thick coat will not be enough to sustain them from the cold. Just like humans, dogs are susceptible to frostbite and hypothermia during the winter. Keeping your dog warm in the winter can be a simple task when you combine the following tips we’ve came up with at Bark ATL’s cage-free overnight dog boarding facility. A dog’s coat isn’t enough to keep them warm during the cold winter weather. 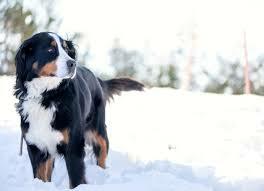 Smaller & thin-haired dogs are more prone to being cold in the winter rather than thicker-haired dogs. A sweater or coat made for your dog will do the perfect job of keeping your dog warm. If you want to take it a step further, there are even booties explicitly made for your dog too. During the winter you shouldn’t keep your dog outside for long periods. The only time you should leave your dog outside for an extended period as if they are exercising and being active. No matter how thick their coat may be, it still won’t be enough to keep them warm. When you are taking your dog outside, many things can get on their paws such as ice, anti-freeze, salt, dirt, and more debris. If your dog licks their paws, they could potentially ingest harmful toxins. To prevent this happening it is highly recommended to clean your dog’s paws each time they come in from outside. Last but not least, you should bring your dog inside during the winter. No dog deserves to be left outside during the cold winter weather. They would rather be inside bundled up with the ones they love the most.